Hebridean fleece is a double coat, with a short undercoat about 2-3" long and a longer top coat which varies from about the same as the undercoat to nearly two feet, but the average is 7-9". The locks are a long triangle in shape, wide at the bottom and tapering to the tips. The undercoat has a 'frizzy' look, because the crimps do not align - this gives wonderful bounce and resilience to the wool and anything spun from it. The top coat has thicker fibres, sometimes coarse and hairlike, sometimes nearly as soft as the undercoat. The soft ones are penalised in the showring, but are lovely to spin. Sometimes there is very little top layer, especially with older sheep, maybe just over the britch and mane area. The colour can vary from very black, which is often the coarsest, to grey or lighter brown, and shearling fleeces are often weathered brown at the tips. Most shearling fleeces are really nice, often with no clear distinction between the two layers, but sometimes, especially with the blackest ones, they can be horribly coarse. The 'crimp' varies from none to about 6 per inch, but averages at about 2, so just a gentle wave - that's in the top coat. When I did my research I didn't measure the crimp in the undercoat, partly because it is very difficult to measure, being frizzy, but also because it is virtually the same in all samples, at about 10 or so per inch. The Bradford score usually quoted indicates very coarse but it was measured years ago by combining the two layers of the fleece. There has been no measurement taken of the two layers measured separately. For my research I measured 'softness' by hand, getting a totally subjective result of course. I scored fleeces 1-5 - none was so soft that I couldn't feel the fleece at all (as with say angora) and none was as coarse as a Herdwick !! Some Heb fleeces, especially the first shears, are soft and silky, some such as tups, are coarse and smelly !! Kemp is not usually a problem in Heb fleece - I mean the proper short white kemp fibres, not just another name for hair. They are sometimes seen, but few and far between. Heb fleece is not the same from shoulder to britch and is not meant to be - the britch is coarser, straighter and often greyer and the shoulder can sometimes have the finest wool - even fairly crimpy by any standards. When I have judged Hebridean fleece competitions, I have been disappointed with the standard of fleeces - often they are very matted and dirty, with double cuts and so on. It is possible to get a beautiful Heb fleece, nicely black, slightly lustrous, clean and soft. For the hand spinner, there is a choice of how to deal with the fleece. 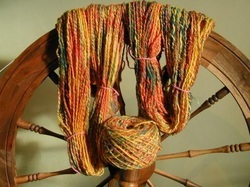 It can be separated into the two layers, the top coat spun worsted for warp, and undercoat spun woollen for finer clothes, it can be spun all together (if not too long) and used for outer garments, or the tips of the outer coat can be cut off and the rest spun as one - this gives a yarn which is less coarse than when the tips are included, but not as fine as the undercoat only. The top coat coarseness often extends only down to the level of the undercoat, with the deeper parts being finer than the tips. The main problem with Heb wool is usually that it is matted - without big machinery it is useless then, other than for putting in the bottom of potholes to keep the stones put on top in place, or to cover the compost heap to keep the rain out. Being black and quite full of lanolin, Heb fleece can also appear to be very dirty so is greatly improved by washing. Sometimes there is a layer of dandruffy stuff in the 'rise' which is very off-putting to spinners, although it can be cut off easily enough. Many Hebs are used for conservation grazing and their fleece tends to be full of either veg matter, often sharp, or full of sand - bad for machinery but maybe not so bad for hand work. The two types of Heb fleece I most like to spin are ones from old ladies who have lost most of the top coat and the undercoat is soft and grey, or shearling fleeces which are soft, lustrous, black and gently waved. 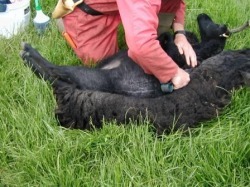 We hand shear all our sheep in the field. This does require fine weather! Hand shearing is quieter and I would suggest easier on the sheep. There is no doubt it does produce a much better fleece for the hand spinner as you cut through the rise, not below it as with machine clippers. It also stops the fleece being contaminated with whatever is on the floor of the shearing shed. 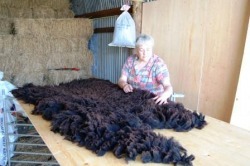 Rooing is an old way of taking off a fleece without shearing. This is only possible with some of the primitive breeds. 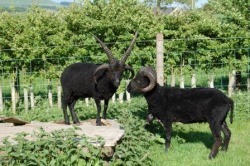 Here Gordon is rooing a black Soay ewe whilst a visiting member of the Falkirk Tartan Project team spins yarn direct from the sheep. We just had to show it can be done! Robin and Sadu Moshe freshly shorn and no doubt feeling all the better for it. Juliet sorting a newly shorn fleece. The hayshed is not the perfect place for sorting fleece, but until the new wool shed is complete it will have to do. There is a surprising amount of work involved in preparing a fleece for show or sale and yet so many buyers expect to get them free or for a pound. 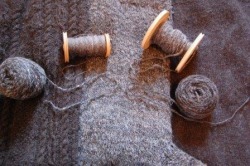 Juliet hand spins our fleeces into yarn for knitting, then knits me superb jumpers.